A big rig carrying 102 cattle on I-81 overturned near Falling Waters, WV last week, leaving dozens of cattle roaming across the interstate. Several of the cattle were killed in the accident, which was caused by the truck driver losing control of his rig at 2 am on Aug. 15. The truck overturned and skidded on its side for 200 feet. 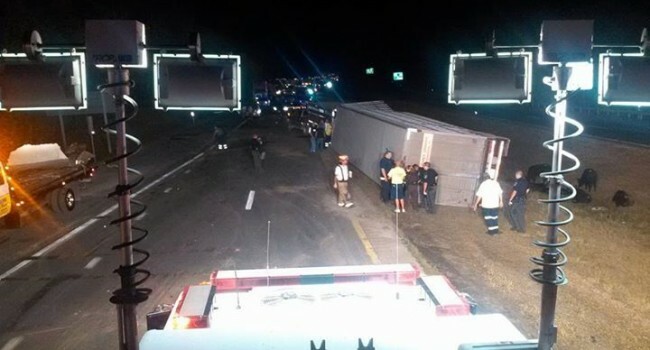 The wreck closed the interstate for more than five hours. We as Virginia trucking accident lawyers are glad that no one was hurt in this accident, except for the animals. We also know that tractor trailers are an extremely important part of moving commerce in the US. However the fact remains that big rig accidents cause severe injury or death in the US every 16 minutes. The reasons these accidents occur are many. In many cases, trucking companies push drivers to overwork and to drive more hours than they should. This leads to driver fatigue and serious accidents. Some trucking firms look the other way as the drivers cut corners, such as not maintaining their vehicle, or they speed. The Federal Motor Carrier Administration now has strict limits on the number of hours a driver can work in a 24 hour and in a week period of time. Still, driver fatigue is thought to cause up to 40% of all truck crashes. People who are injured in a truck accident always should consult attorneys who are experienced in such accidents. A truck accident is more complicated than a simple car accident. There are complex factual and evidentiary matters that come into play in complicated big rig accidents.